As Deutsche's Craig Nicol writes, a major data release for markets will be Chinese GDP for Q1 on Wednesday, where the consensus is that the year-on-year reading will fall slightly to 6.3%, from the previous quarter’s 6.4%. That day will also see the release of March’s industrial production and retail sales data for China, so there’ll be a number of things to look out for. Also from Asia, we’ll get the March Japanese CPI reading on Thursday, where the consensus expectation is for a rise in the year-on-year reading to 0.5%, up from the previous month’s 0.2%. Monday: It’s a fairly light start to the week with scheduled data releases including the UK's April Rightmove house prices followed by the release of April Empire manufacturing and February TIC flows both in the US. Away from the data, the BoJ's Wakatabe, BoE's Haskel, the ECB's Villeroy and the Fed's Evans are all due to speak. The Japanese economy minister will also be visiting the US for trade talks. Goldman Sachs and Citigroup will release earnings. Tuesday: It’s another quiet day for data with key highlights being the release of March new home prices in China followed by the release of employment data in the UK for the December-February period, as well as the March claimant count rate. We'll also get February construction output in the Eurozone and the April ZEW survey results in Germany and the Eurozone. In the US, we’ll get March industrial production and capacity utilisation along with April's NAHB housing market index, as well as Canada's manufacturing sales for February. In addition to the data releases, the Fed's Rosengren and Kaplan are due to speak, as well as the ECB's Nowotny. Bank of America, Netflix, IBM and Johnson & Johnson will release earnings. Wednesday: It’s a very busy day for data with the key highlight likely to be the release of Q1 GDP in China (overnight). We will also get Japan's March trade balance and China's March macro data dump including retail sales, followed by the release of March new car registrations in the Eurozone along with the February trade balance, final March CPI in Italy and the Eurozone and the UK's March inflation data. In the US, we will get the latest weekly MBA mortgage applications, February trade balance and wholesale inventories data along with the Fed's latest Beige Book. Away from the data, the BoE's Carney, ECB's Villeroy and the Fed's Harker, Bullard and Logan are all due to speak. Meanwhile, the Indonesian presidential election will be taking place. Morgan Stanley and PepsiCo will release earnings. 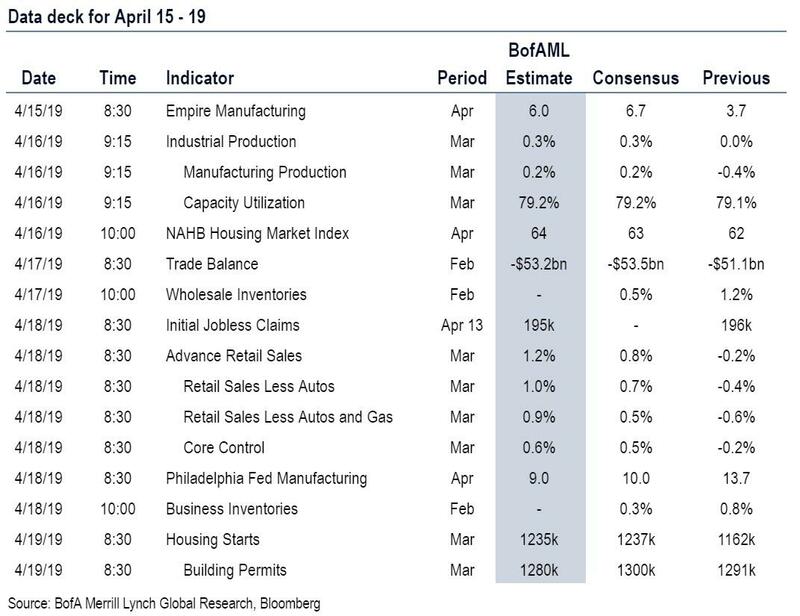 Thursday: The key highlight of the day is the release of preliminary April PMIs in France, Germany, the Eurozone and the US. Besides that we will get employment data from Australia for March, March PPI in Germany, March retail sales and the BoE's credit conditions and bank liabilities surveys in the UK along with the release of March retail sales, April Philadelphia Fed business outlook, the latest weekly initial jobless and continuing claims, March leading index and February business inventories all in the US, and Canadian retail sales for February. Away from the data, the Bank of Korea will be making their latest decision on interest rates and the Fed's Bostic is due to speak. Philip Morris International and American Express will release earnings.